The Schwinn Discover Hybrid Bike for Women offers an adventurous experience for ladies seeking to explore the freedom of nature. The frame of this beauty is styled for city riding and is manufactured from a high quality aluminium material to provide for a durable, tough, yet light weight product. The seat is configured to support the biker in an upright position and comes with a suspension fork with excellent shock absorbing properties and a seat that is well padded for comfort. This bicycle is ideal for moving around town, quick trips to mall, shuttling to work or just enjoying a leisurely ride in the neighbourhood. It comes with extra features such as a twenty one speed gearing system with SRAM shifters that are grip operated for a quick, simple and seamless changing of gears, a TX-31 model rear derailleur from Shimano, an alloy crank from Schwinn, brakes from Promax utilizing the linear pull method, handlebar that its stem is adjustable and in a sweep-back configuration, powerful fenders and a gear carrier at the rear. Frame manufactured with durable aluminium and designed in a cross-hybrid configuration. Sports a TX-31 derailleur located at the rear for seamless gear changes and is manufactured by Shimano. Linear pull braking system from ProMax for offering a superb stopping force. Seat comes well-padded for optimum comfort. Twenty speed grip shifters utilizing the SRAM technology. Suspension fork from Schwinn that eats up bumps with ease. A handlebar that comes adjustable via the stem to allow for a proper sitting configuration. Unless you are good at assembling bicycles, then you need to take this bike to a bike shop to have it properly set up if you want to effectively maximise the functionalities that comes built into it. For a casual riding experience, the Schwinn Discover Hybrid Bike for Women performs exceptionally. It comes with a variety of gear changes that give you speed options to manipulate as the situation or road condition demands. The components works well together with perfect cooperation to deliver a nice riding experience. However this bike is limited to casual and less demanding riding situations. 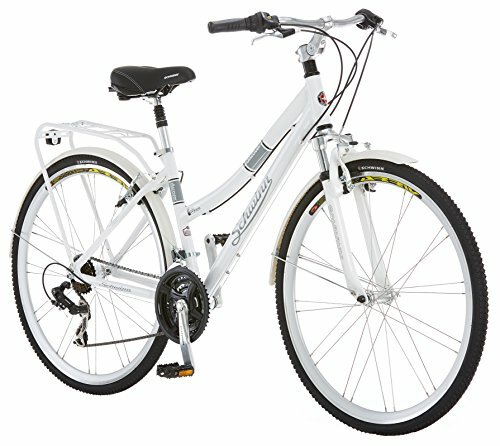 This bike is the best choice for women looking to get a bike for quick trips and leisure rides.